If you use conventional laundry products, you might not knowingly be feeling the effects now, but you more than likely have some neighbours who do! Dryer vents are undisclosed, unregulated chemical distribution devices. you choose what your neighbours have to breathe! and can enjoy their homes and properties too! 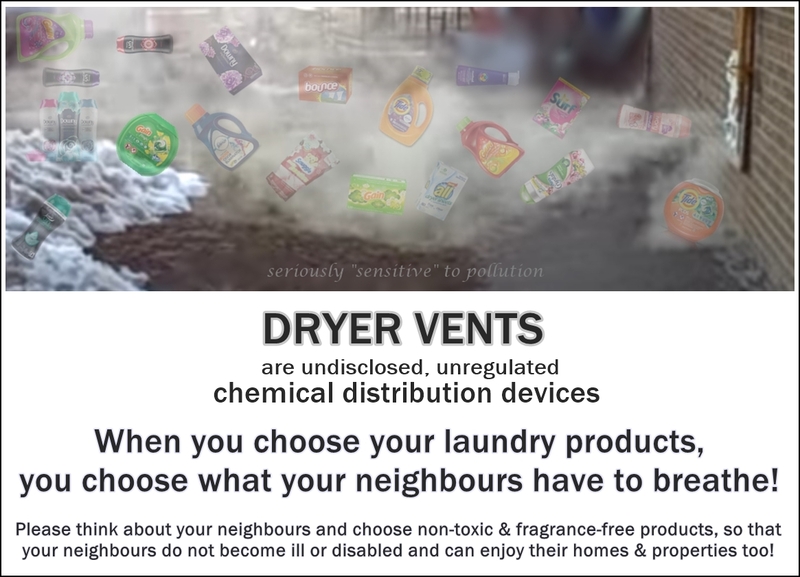 A growing number of people (millions, not handfuls) cannot enjoy walking about their neighbourhoods, sitting or working in their own outdoor spaces, or even open the windows of their homes due to the harmful pollutants released from dryer vents that were designed to emit moisture, not drifting toxic chemicals. Laundry products should not be disabling people or cause short term adverse health effects like asthma, headaches, migraines, confusion, vomiting, dizziness, etc., or longer term effects like reproductive and neurodevelopmental problems! EWG has a website where you can check the ratings for the products you use. It’s a great place to start learning which products to avoid, and which are safer options.